Finding fun activities that did not cost the earth, over the summer holidays was a hard task. In some ways I am fortunate that Liv loves crafting so much and paper and scissors can always provide entertainment… until it comes to clean up time! It was a lovely break from picking up bits of paper when we made use of the Chocolate Animal Lollipop Making Kit we had recently been sent from Choc On Choc. This was Liv’s most favourite treat… and mine too come to think of it, not so much for the scales though! 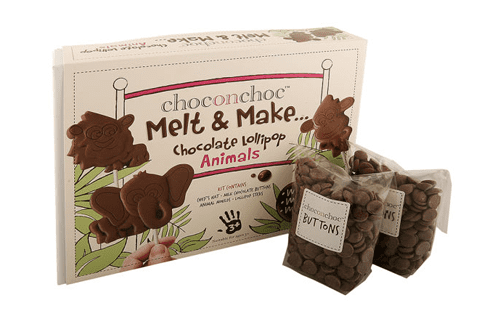 The kit is part of a range of ‘Make Your Own’ chocolates from Choc On Choc and the Animal Lollipop set included two moulds to make 5 different animals, along with 300g of milk chocolate buttons to melt and substantial plastic lollipop sticks. A chef hat is included too which was commandeered by Liv straight away! Easy to make, it was simply a case of melting the buttons in the microwave, folding the melted chocolate into the moulds and letting them set in the fridge for 20-30 minutes. The hardest part was actually waiting for them to be ready! I was surprised by how large the fully made lollipops were and how thick they were too! The chocolate was divine and creamy – very much like a well known brand that begins with a G! Liv was in her element, her friends were in their element and so was I. I would recommend keeping them in the fridge for a little while longer… but that’s just me, I prefer chocolate that has been in the fridge that I really do need to bite into. The moulds and plastic lollipop sticks are easy to clean and will be used again when I buy more chocolate… that lasts long enough for me to melt it! The animal shapes are seriously cute and the moulds definitely define each characteristic of the animals. The range includes: Animal Lollipop Making Kit, Build Your Own Chocolate House, Make Your Own Chocolate London (which looks fun!) and Make Your Own Egg… all priced at a very reasonable £12.99 from Choc on Choc. Dare I already bring up Christmas… I guess I just have done… but there would make a fantastic present for any chocolate lover and friends should be expecting to receive one this year!